Stay in the stunning Can Shui villa set on a cliff top with mesmerising views of the Mediterranean Sea. Can Shui is pure luxury, just what every Goddess deserves. With Yoga daily on our outside Yoga Shala with views out to the sea. Nourishing food for breakfast, lunch and dinner. The chance to explore the private beach at the base of the cliff, try Stand Up Paddleboard (SUP ) Yoga, visit the hippy beach at sunset for the drumming party, view the magnificent Es Vedra and more! You can soak up the sun by the infinity pool, find a comfy seat to lounge in reading a book, enjoy chatting with new friends. Ibiza is the Island of the Goddess Tanit, also known as Juno Celeste, she is the mother of all waters and was of the stars. Ibiza is a place of healing and fertility - the island is rich in olive groves, vineyards, lemon and orange groves and the seas rich with fish. Give yourself this gift of retreat in Ibiza to reconnect and reclaim your inner Goddess as you are nourished and healed with amazing food and Yoga. This retreat is for the Yogini that loves luxury, laughter and a little adventure. If you crave that 'me time' but at home you get distracted by the phone ringing, the kids shouting or lack of space. You give yourself 110% at work, to your family and loved ones but overlook yourself. Take a week for yourself in the glorious Spring sunshine, fully immerse yourself in a week of yoga and healthy, nourishing food. Feel confident and empowered as you meet new friends as you enjoy giggles by the pool and conversations around the dinner table. Return home feeling refreshed, relaxed and with your cup overflowing. Regale in stories of your adventures about meditating on the beach in the moonlight to trying Stand Up Paddle boarding on the Mediterranean Sea. Perhaps you tried crow pose or headstand or maybe you fell in but it makes you smile knowing you had a go. Can Shui has a range of stunning luxury accommodation for you to choose from whether its the 4 poster bed suite or a room with a view. Mega by name, mega by nature! This suite allows you to share a space in a luxurious manner. This is no dorm! More than a suite the space offers an extremely spacious area to sleep four social souls, walk in wardrobes and dressing area, a semi open plan dramatic bathroom with bath, shower and enclosed toilet. An adjoining room with lounge area and private bathroom. The living space has its own balcony set in a curved turret, floor to ceiling windows and spectacular views. Early bird price when booking before 1st February £1300 per person. Price increase to £1500pp from 1st February 2019. As you enter the light filled Shiva and Shakti suites your eyes will be immediately drawn to the phenomenal view through the floor to ceiling windows. As your focus settles on the room and décor you will not be disappointed. Both rooms have stunningly designed bathrooms with twin sinks and glass encase showers allowing you to shower whilst admiring the breath-taking view. The rooms have their own balcony offering the perfect place for quiet time or a luxurious pamper session. Early bird price when booking before 1st February £1400 per person. Price increase to £1600pp from the 1st February 2019. 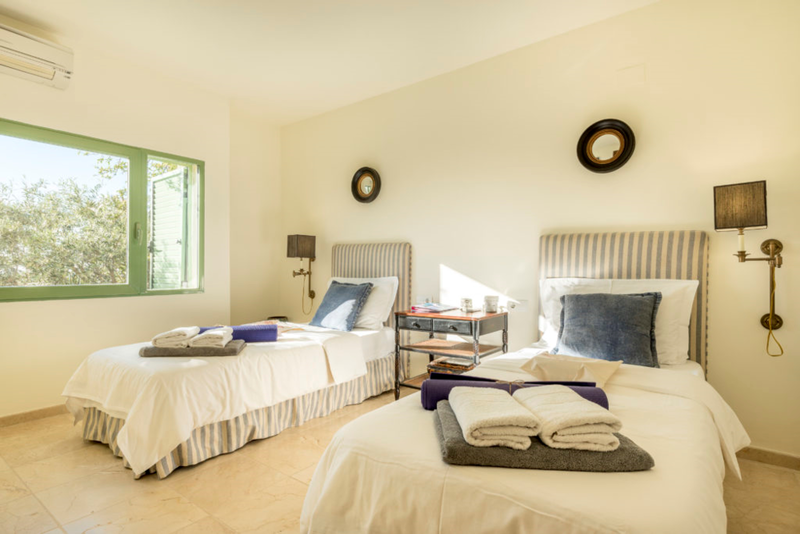 Both twin suites offer simple, comfort accommodation with a large window and dreamy views of the gardens with the sea view into the distance through the olive branches. Located close to the Zen Den, our first floor living space and wellness therapy area, providing another space to relax. Please note the Yin and Yang suites share a bathroom. Early bird price when booking before the 1st February £1350 per person. Price increase to £1550pp from 1st February 2019. Moroccan suite in a courtyard tucked away from the main house behind a gran wooden door. The dramatic double height ceiling creates the perfect setting for this luxurious room. From the privacy of the 4 poster bed a clever one way window allows views out to the sea and across the courtyard. The room also boasts a fireplace, an incredible ceiling height waterfall shower, twin sinks and separate ensuite bathroom with toilet. Moroccan influences throughout the suite give the feeling of being in a beautiful Riad, which is truly quite special. Early bird price when booking before 1st February £2600, can be booked as a luxurious single or shared with a friend and split the cost. Price increase to £2800 from 1st February 2019. To book your place click on the button to the left to take you to our Billetto site. Select GET TICKETS and choose your room selection and complete your details. You do NOT pay via Billetto. Email Rachael at hello@yogawithrach.co.uk to be sent payment details. Payment plans are available please request this in your email. A non-refundable deposit of £300 is required to confirm your place with 2 further instalments depending on when you book. Final balance payments are due by 27th February 2019. Rachael started teaching Yoga in 2012 having first found Yoga in 1999. Rachael believes Yoga is for everybody to enjoy and experience. 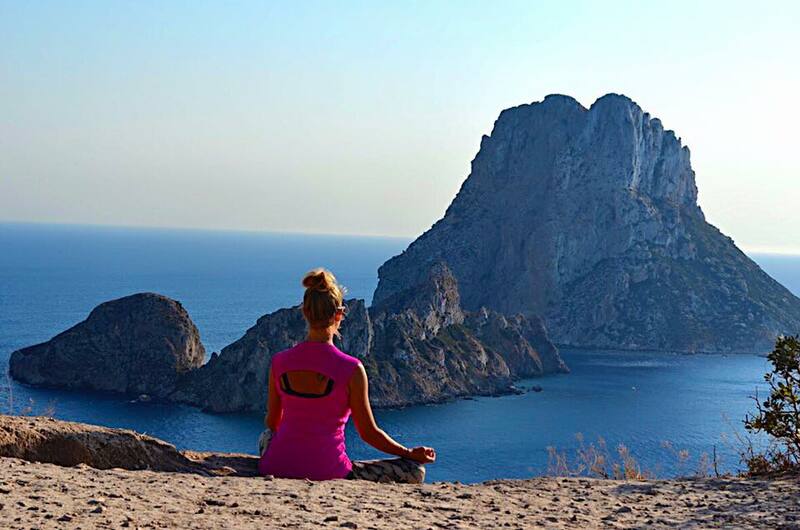 Rachael has been running Yoga retreats since 2013 in Glastonbury, Morocco and Ibiza creating a safe, fun and nurturing space for you to live and breathe like a Goddess for the week. Whether you are travelling alone, with friends or a partner, new to Yoga, a lover of movement and sunshine or a Yoga Teacher, all are welcome. Rachael looks forward to welcoming you to the mystical island of Ibiza in 2019.